The biographies of the three men buried in Tennessee are now complete. Private Thomas Camp served in England with 23rd Reserve Battalion, Canadian Expeditionary Force. He was sent home suffering from tuberculosis and died on 2 May 1921 in the United States Public Health Service Hospital at Whipple Barracks, Arizona. 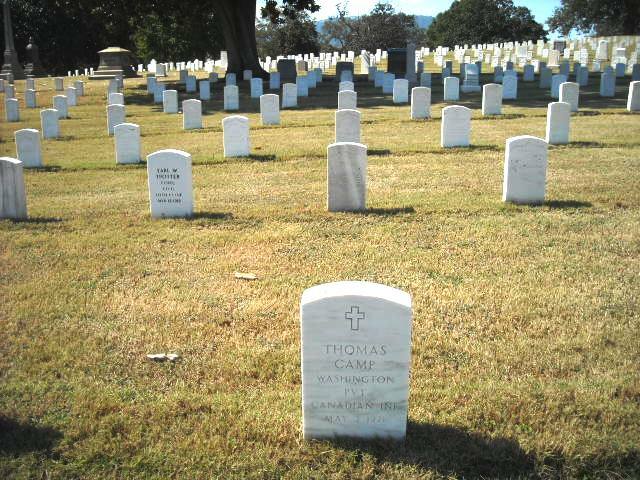 He is buried in Chattanooga National Cemetery. Sapper Lee Arvel Moss served in France and Flanders with 4thBattalion, Canadian Railway Troops. He died of tuberculosis at Sainte-Agathe-des-Monts, Quebec on 19 August 1919 and is buried in Short Creek Church Cemetery, near Athens. Corporal William Vannah Taylor was born in Louisiana and served with 3rdCanadian Engineers Reserve Battalion in England. He died of nephritis in Memphis on 25 August 1919 and is buried in Forest Hill Cemetery Midtown. This entry was posted in First World War, My Current Projects on October 31, 2015 by Nick Metcalfe.